So the past few days I have been out and about in Krems, Austria and there is so very much to absorb here! Yesterday alone I walked over 7 miles in awe! I am like a sponge soaking up Krems and I admit it is overwhelming! I will be writing more in the future about what I am seeing and doing as well as my reflections of this beautiful, historic town and area along the Danube River. As I have said previously, Krems is “old” and I am so consumed with the architecture that I am rapidly filling the memory in my iPhone as I take one photo after another. But today I felt like I have to draw a line otherwise I would be taking pictures of everything! So the line I drew is this…unless it has some particular aesthetic value, I want to take photos if the structure (or whatever) came about prior to 1600! So that, for now, will be my guide for photographing and sharing “old” Krems. Krems is the eastern gateway to the Wachau Valley which is a World Heritage Site. Today I want to share with you a photo of a local fountain and the story that goes with it, The fountain is near my apartment and is of a man on a knee before a woman with the inscription “SIMANDL”. 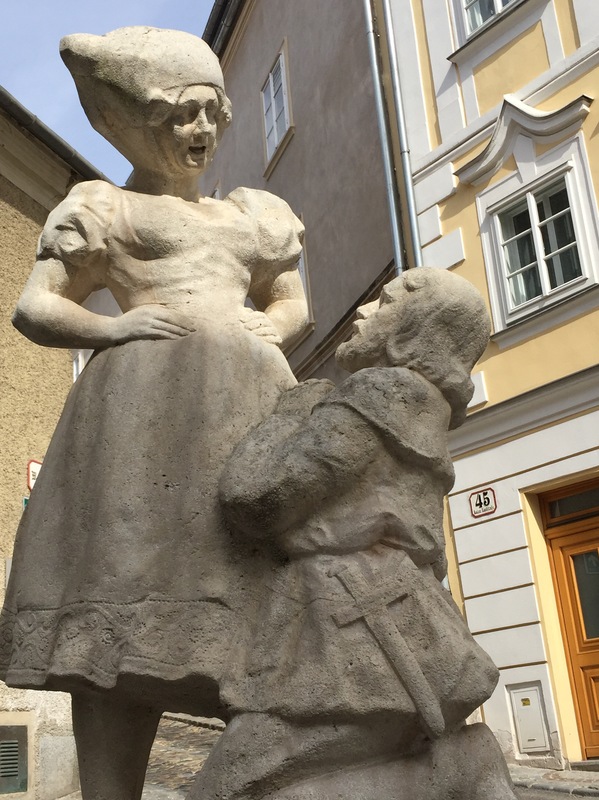 I thought it was a man proposing marriage but it turns out that “simandl” means “henpecked!” The monument is about the story of the town’s men and, in this case, a man imploring his wife to give him the house key so he can participate in a man’s night out! You can read more about this very interesting fountain at this link here. The food is terrific! I have eaten pork in many ways and there are so many cafes to grab a fragrant coffee, bold wine, or warm strudel in vanilla sauce. Even though it was cold today, I along with others ate fresh-made ice cream! Who can resist a cone for 1 Euro (about $1.10)! Previous Previous post: From 28 C in Mijas, Spain to 5 C in Krems, Austria!